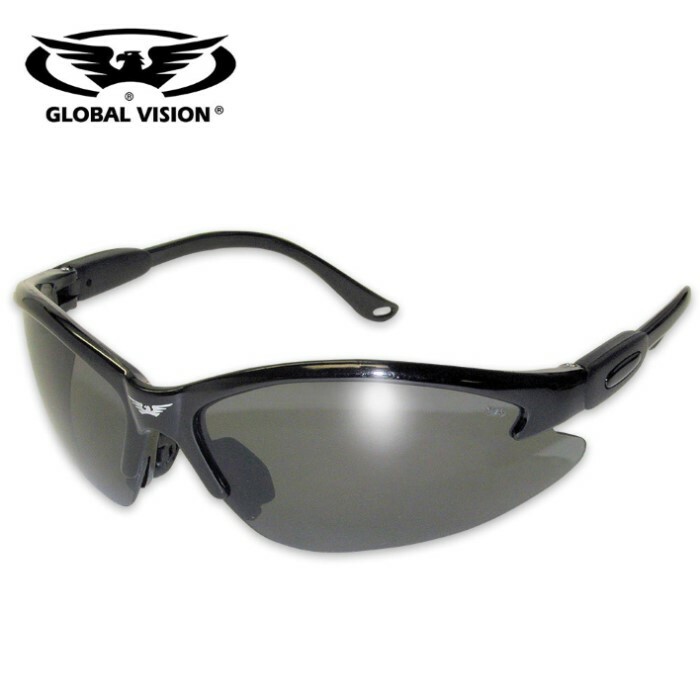 Global Vision Cougar Safety Sunglasses - Smoke | BUDK.com - Knives & Swords At The Lowest Prices! Comfortable and stylish, the Global Vision Cougar Safety Sunglasses will protect your vision from shop to road. These safety sunglasses feature cutting-edge technology that goes above and beyond UV protection, offering protection from 99 to 100 percent of harmful light. With an ANSI Z87.1-2010 Standards for use in industrial applications rating, they have endured extensive testing for optical clarity, impact resistance and proper eye coverage. The open black nylon frame features high flexural strength and superior wear resistance and the smoke-colored lenses are of shatterproof polycarbonate with a scratch-resistant coating. This durability allows them to withstand forces that would damage other eyewear.